Gooding, Texas, is about to gain a double blessing--a veterinarian and a doctor. But when siblings Enoch and Taylor Bestman arrive, the discovery that the long-awaited doctor is in fact a woman has the town up in arms. Karl Van der Vort is no exception, though he becomes Taylor's first patient...against his will. Karl finds he can't deny Taylor's doctoring skills, but he also can't come to terms with her unladylike occupation. Taylor, on the other hand, wants only to prove that doctoring is her life's calling, despite the town's opposition. But when her practice--and Taylor herself--are threatened, Karl's protectiveness flares into a different emotion altogether. 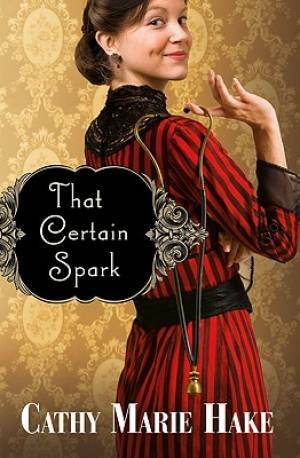 That Certain Spark by Cathy Marie Hake was published by Bethany House in October 2009 and is our 17473rd best seller. The ISBN for That Certain Spark is 9780764203206. This is an enjoyable book with a very well written cast of characters. Once I'd got past the first couple of pages, the fast pace of the story made it a compulsive read. Taylor & Enoch Bestman move from the city to a small country town, where Enoch is to take up a job as a vet, and Taylor as the town's new doctor. The trouble is, Taylor is a woman, and there are a lot of local people who aren't happy about having a female doctor. However, as well as those who voice their opinions (loudly), there are those who take a more proactive approach to getting rid of their new GP... The 'romance' elements of the story, for both Enoch & Taylor, are handled very well. Enoch's romance is very abrupt, but his new found happiness is threatened early on, in a twist which is handled beautifully & authentically by the author. Twins, Enoch and Taylor Bestman, have been accepted by the small town of Gooding in Texas, to become their Vet and Doctor respectively. Unfortunately this is 1892 and by an oversight, the Mayor has not realised that Taylor is a woman and he sets about making life as difficult for her as he can, with the aim of stopping her practicing and driving her out of the community. Despite her skill, some in the township do not intend to change their minds and as the story unfolds and she is left alone in the house by Enoch marrying a local widow, frightening things occur. All this while the bond strengthens between Taylor and Karl, a local blacksmith, as Karl accompanies her on her visits to outlying patients. A very enjoyable story and a reminder of how recently attitudes to women have begun to change. Twins, Enoch and Taylor Bestman, have been accepted by the small town of Gooding in Texas, to become their Vet and Doctor respectively. Unfortunately this is 1892 and by an oversight, the Mayor has not realised that Taylor is a woman and he sets about making life as difficult for her as he can, with the aim of stopping her practicing and driving her out of the community. Despite her skill, some in the township do not intend to change their minds and as the story unfolds and she is left alone in the house by Enoch marrying a local widow, frightening things occur. All this while the bond strengthens between Taylor and Karl, a local blacksmith, as Karl accompanies her on her visits to outlying patients. A very enjoyable story and a reminder of how recently attitudes to women have begun to change. Loved it - a great continuation of Cathy Marie Hake's Gooding, Texas Series. A doctor & a vet (twins) arrive in Gooding - the problem...Well, the mayor didn't realise the doctor was female! Taylor has to prove herself. Karl Van der Vort doesn't cotton to the notion of having a lady doctor in town either, until she saves his life! He gradually changes his mind...& soon becomes her protector & defender. Got a question? No problem! Just click here to ask us about That Certain Spark.